Rule-based modelling allows to represent molecular interactions in a compact and natural way. 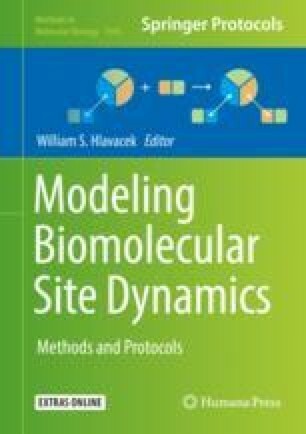 The underlying molecular dynamics, by the laws of stochastic chemical kinetics, behaves as a continuous-time Markov chain. However, this Markov chain enumerates all possible reaction mixtures, rendering the analysis of the chain computationally demanding and often prohibitive in practice. We here describe how it is possible to efficiently find a smaller, aggregate chain, which preserves certain properties of the original one. Formal methods and lumpability notions are used to define algorithms for automated and efficient construction of such smaller chains (without ever constructing the original ones). We here illustrate the method on an example and we discuss the applicability of the method in the context of modelling large signaling pathways. Electronic supplementary material: The online version of this chapter ( https://doi.org/10.1007/978-1-4939-9102-0_14) contains supplementary material, which is available to authorized users. Tatjana Petrov’s research was supported by the Ministry of Science, Research and the Arts of the state of Baden-Württemberg, and by a Swiss National Science Foundation Advanced Postdoc.Mobility Fellowship (grant number P300P2_161067).